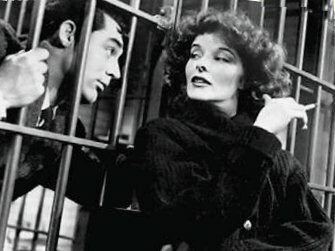 Twice the perfect pairing of Cary Grant and Katharine Hepburn came to the screen in 1938, and it’s truly difficult to choose between them: Howard Hawks’s Bringing Up Baby is laced with the acidic energy of Hawksian bodies in motion, and George Cukor’s Holiday is cradled in the idea of sanctuary and integrity. The stylized whirl of Baby becoming one of Hawks’s many versions of paradise, in which the players and their ability to play together becomes the subject of the movie; and the gentle-but-firm humanism of Holiday makes “play” a legitimate choice, as opposed to the stuffy world of the squares and businessmen. The Lady Vanishes is one of Hitchcock’s most enjoyable concoctions; Olympia is quite an experience in daft aesthetics; and Robin Hood is somehow not as high in my esteem as it is for many, as fun as it is. In a historically “off” year for the movie business, actors define some of my choices: led by Grant and Hepburn, but also the glorious work by Leslie Howard and Wendy Hiller in Pygmalion; Cagney and co. in Angels; and Mickey Rooney and Spencer Tracy in Boys Town, an admittedly sentimental choice (Rooney is a buzzsaw in the thing). I have never seen Three Comrades – could somebody put it out on DVD? Coming up behind: Capra’s oddball You Can’t Take it with You, Carne’s Port of Shadows (also oddball), and a Disney short called Wynken, Blynken and Nod, which is as lush as animation gets.